Xiaomi has introduced a new photo printer. This is the first printer to be sold under the “Xiaomi” brand. The product, like so many Xiaomi projects, the Xiaomi Mijia Photo Printer is financed via crowdfunding. Last year, a small XPRINT printer was launched on the Chinese market, which was also sold by Xiaomi. The very small device was intended as an accessory for smartphones and could print small photos in a maximum size of 5.4 x 8.6 cm. The fact that the app required your Chinese phone number made the otherwise cool device for the western market unfortunately uninteresting. With the new printer this will hopefully be different. 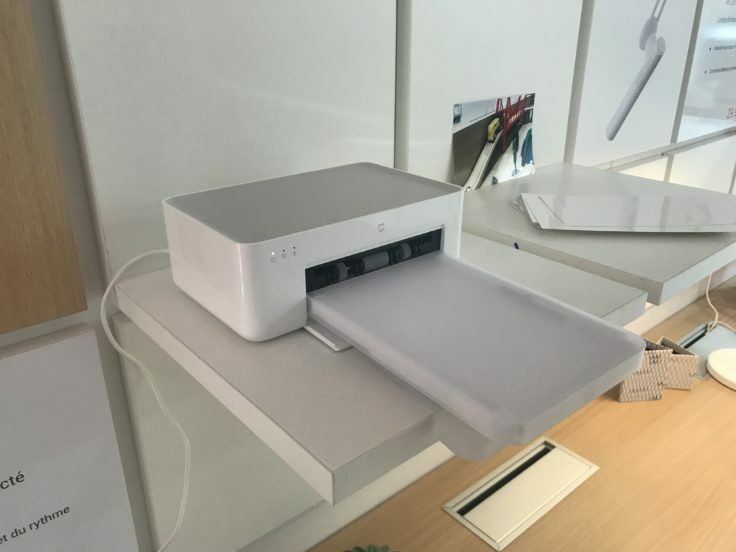 We have already seen the printer in the Xiaomi store in Paris. The new printer is now a little bigger and with the dimensions 194 x 124.6 x 83.6 mm not meant for on the way anymore. Externally it corresponds to the typical Xiaomi design in plain white. At first glance, it could be mistaken for a Bluetooth loudspeaker if you look at the ventilation on the back. On the upper side there is a single button for switching on the device. The printer prints photos up to six inches in size. A set of 40 sheets of photo paper can be purchased separately and costs 59 yuan, equivalent to about $8.50. This results in a price of approximately 21 cents per photo. The photos are printed with 300 dpi and covered with a protective film to prevent scratching and fading over time. The Xiaomi Mijia Printer is now available in the China shops for an acceptable price. We are currently looking for a test device. All in all, the printer looks promising, both operation and price look good. If the problems of the XPRINT printer are not repeated here, and this does not appear to be the case, the photo printer will certainly find some customers in Europe as well. What do you think of the printer? Will it be available in the u.s.